The day started so well. 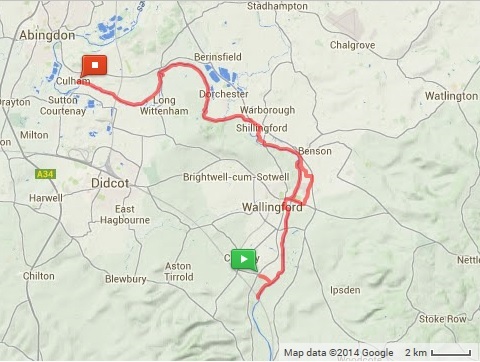 Despite a lengthy drive and a train ride, I was on the ground at Cholsey and walking by 9.30. My phone app missed the first mile or so, but it was fine before I got back to the river. And, due to my self-imposed pedantry, I had to walk a mile east and then re-trace my steps west so I was about three miles in by the time I started making proper progress. But the sun was warm and the people of Oxfordshire were very charming – cheery greetings all around. Even from the fishermen, at least to start with. Later the fishermen would as usual just stare blankly at the river and not acknowledge anyone walking past. In all this project so far I have not seen any one of the many fishermen I have come across actually catch a fish. Maybe that is why they always seem so depressed. I once had a landlord who would go out fishing of a weekend and who would then go out to the pub with his mates before going home usually significantly the worse for wear. One weekend he went out fishing and forgot to take his fishing gear. He didn’t even realise until he got home and his wife pointed it out to him. I think that maybe these guys sitting by the river are just waiting to get to the pub and haven’t yet realised that they don’t have to spend hours failing to catch fish before they do so. 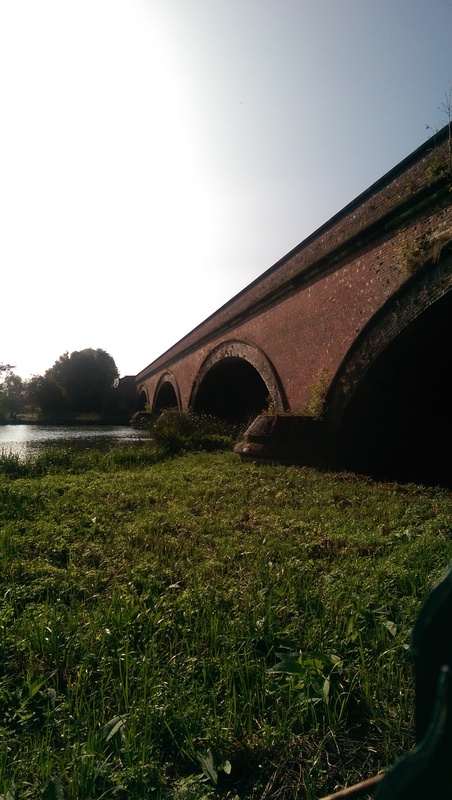 Over the river at North Stoke, far away across the field the tolling of the iron bell called the faithful to their knees (apologies to Roger Waters) and I spotted a picnic spot we used to visit sometimes. Not actually a picnic spot but a piece of private land by the river which the owners said anyone could use so long as they didn’t make a mess of it. Lord knows how we first found it because it’s not somehwere you would just stumble across. But we did find it and we did enjoy it and we even went swimming in the river. Crazy kids. 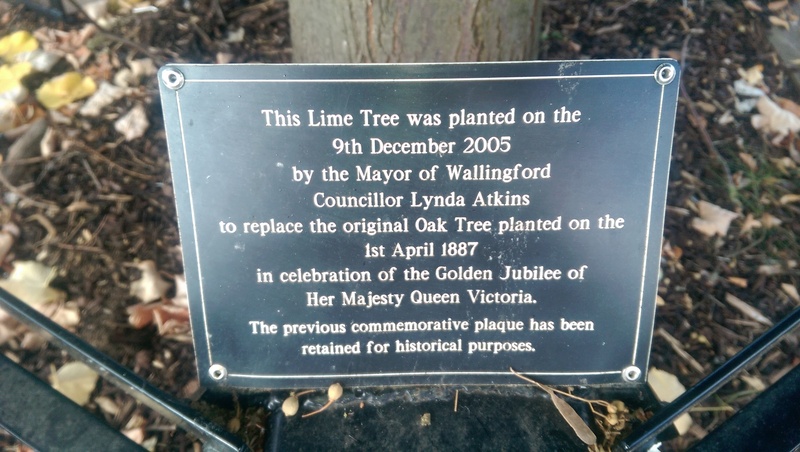 At Wallingford I took a break in the shade of the Queen Victoria Golden Jubilee Commemorative Lime Tree, which was planted in 2005 to replace the Queen Victoria Golden Jubilee Commemorative Oak Tree which had been planted in 1887 somewhat presumptuously a couple of months ahead of the actual jubilee. The plaques do not relate why the poor old oak tree had fallen so badly out of favour that it was uprooted and replaced. Maybe scurvy was a bit of a problem in early 21st century Oxfordshire. Suitably rested I resumed walking and that’s when it all started to go wrong. Reaching Wallingford Bridge I followed the path northwards on the western bank. 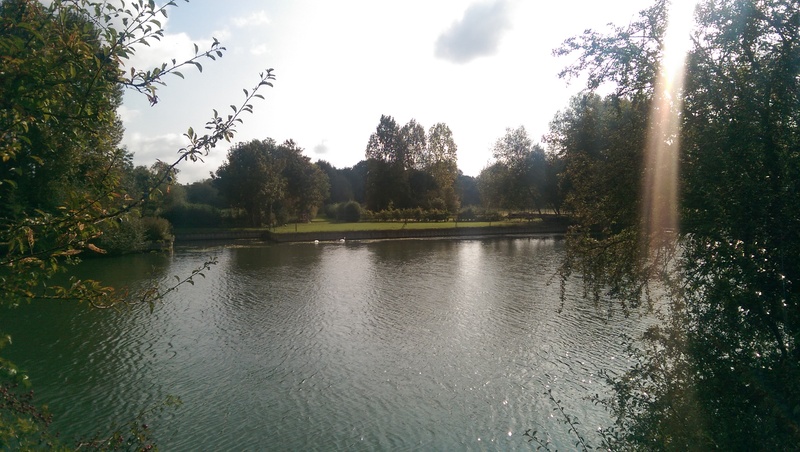 A pleasant enough walk, past the site of Wallingford Castle which back in the day was a major fortress but which was destroyed after the last of a number of sieges. All very interesting I mused as I approached Benson Lock where the path crosses the river. At least it used to. I arrived at the lock to be confronted by a sign reading “Footpath Closed. Weir Unsafe. Follow Diversion”. I looked around, and then looked around again in case I was missing something but could see no sign of a diversion. “Excuse me” I said to the lock-keeper “where’s the diversion?”. “You have to cross at Wallingford Bridge and follow the road” he said, before adding quite unnecessarily “assuming you’re travelling upstream”. Well of course I was travelling upstream. It was apparent to me that there was no way of travelling downstream to the point where I was standing except by boat. One would hope that such a fact would not be lost on a lock-keeper. 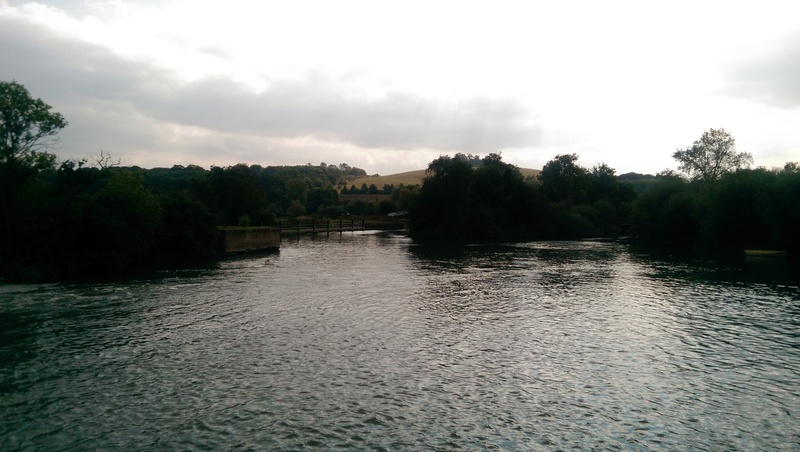 A lock keeper who added – again, unnecessarily and incorrectly – “The signs are perfectly clear”. No they are not, otherwise why would I be standing here on the wrong side of the river? 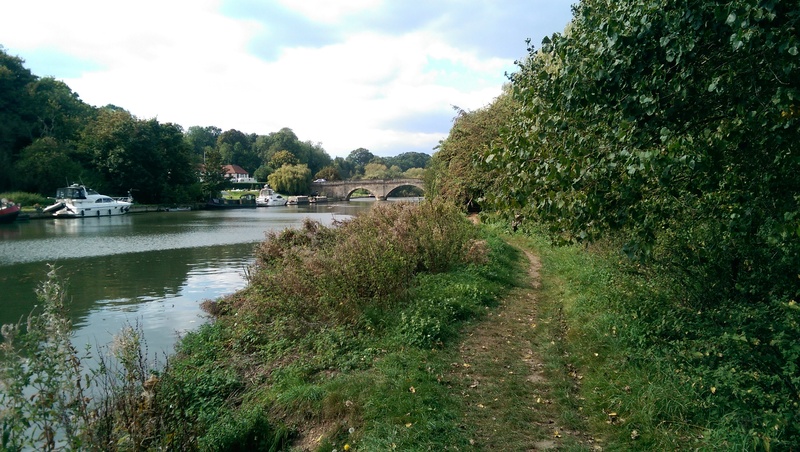 And on my ill-tempered walk back to Wallingford Bridge (via the site of Wallingford Castle, blah blah blah) I spoke to several other walkers who were also oblivious to the footpath closure. So it wasn’t just me. On the plus side, the diversion (yes, thank you, I can now see the big yellow signs. It was only the first one that was a problem, but that was kind of important…) did at least allow me to view the wonderfully named “Jethro Tull Gardens”, a modern cul-de-sac either named after the 18th century agricultural pioneer or the 20th century prog-rock band. I’m not certain which, but I think I can guess. That and a house with a penny-farthing bolted to its front wall. The diversion led me along the – frankly quite dangerous – A4074 by RAF Benson, a massive airfield, “a front line support helicopter base” they say, and a place where my father-in-law spent many happy hours during his national service. However in all my many years of living in the region I have never seen any aircraft movements at Benson. Nor for that matter any aircraft. Today was no different. Tumbleweed. And then to the other side of the weir at Benson Lock. Here, the signs were very clear and well placed. 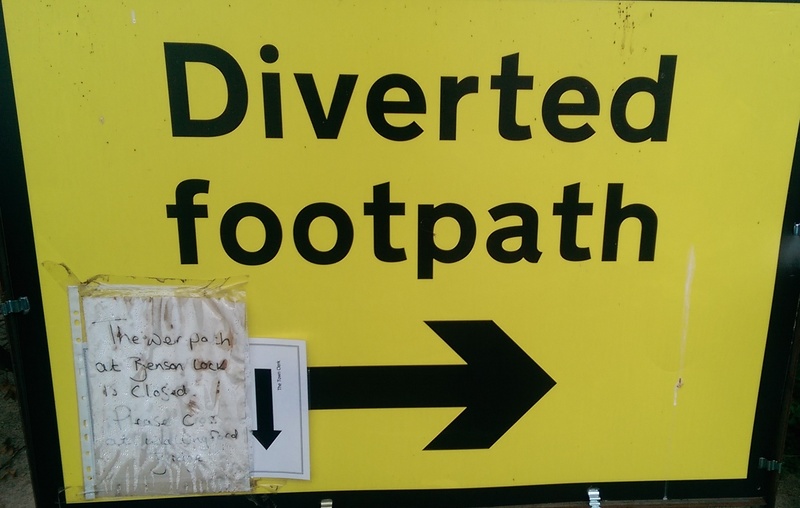 Although one sign did state “Footpath closed until Feb 2014” with “until Feb 2014” crossed out and replaced by “indefinitely”. 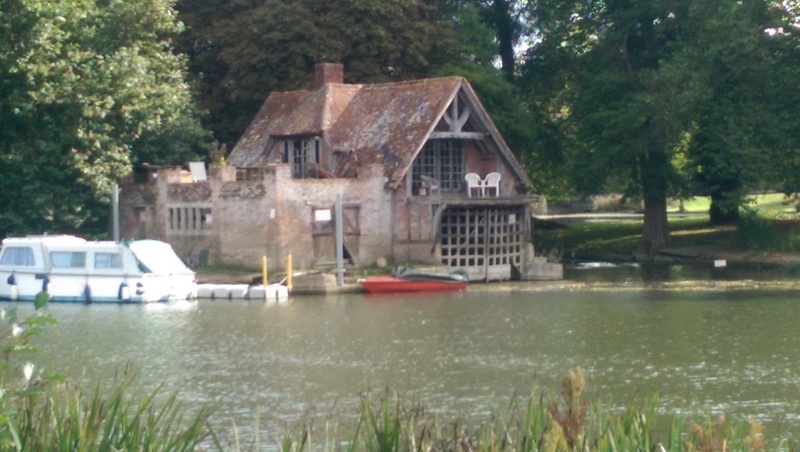 At Shillingford there is a beautiful massive old riverside house but you can’t easily see it from the footpath – which is diverted around it – because of the huge walls surrounding it. 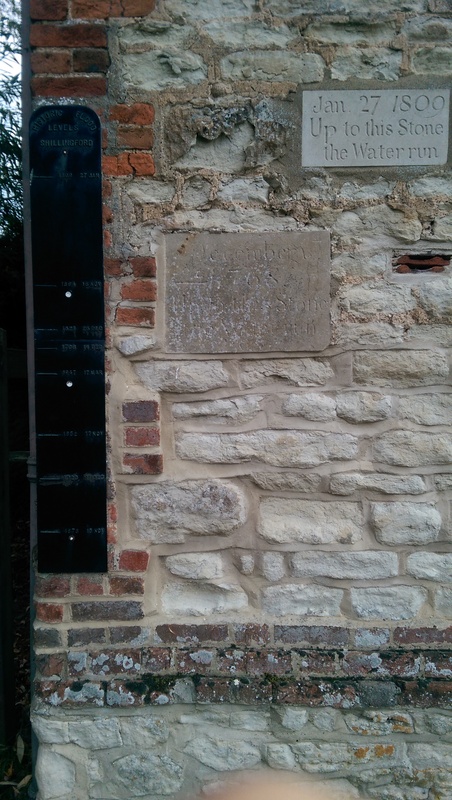 But where the footpath returns to the river there are some interesting flood markings on the wall, the highest being from 1809. I was standing about four feet above the river’s current level, and the 1809 flood mark was at least six inches above my head. You may or may not be aware, but I’m quite tall. So I reckon the flood level was almost eleven feet above normal and the land around Shillingford is quite flat so the flood must have spread for miles. The exception to the flat land around Shillingford is to the west where the Wittenham Clumps rise above the landscape. The Clumps are two hills that rise to about 70m above the river and have ancient beech tree plantings on top. There are the remains of a Bronze-Age hill fort but the most surprising thing I have discovered about the Clumps is that they are apparently the most-visited outdoor site in Oxfordshire. Very attractive, nice views and all that, but really? The most visited? Crossing the open fields towards Day’s Lock near Dorchester I started thinking about cider. The sun was out, the afternoon was warm and I thought about a glass of ice cold cider. The lovely cold golden appley liquid hitting the back of the throat… And then I saw a woman enjoying a picnic accompanied by a cup of tea. And suddenly all I wanted was a cup of tea. You see it, you want it. I then hoped to see someone enjoying a glass of cider to return me to that place in my mind as I had been rather enjoying that reverie, but it wasn’t to happen until later. At Clifton Hampden I crossed the river, but not before visiting a pub. You may know from earlier legs that I am not good at nutrition when walking and I had been feeling quite feeble for a couple of miles before getting there. Peanuts are probably not the athletes choice for an energy boost but they were quick and I felt less hungry afterwards. However when I reached the pretty lock at Culham I blew up. Completely ran out of steam. I’d like to blame the Environment Agency for the extra mileage they imposed on me, but it was probably as much to do with my own foolishness in failing to keep fuelled, so this leg ended there. And when I got home, did I refresh myself with cider or tea? What do you think? 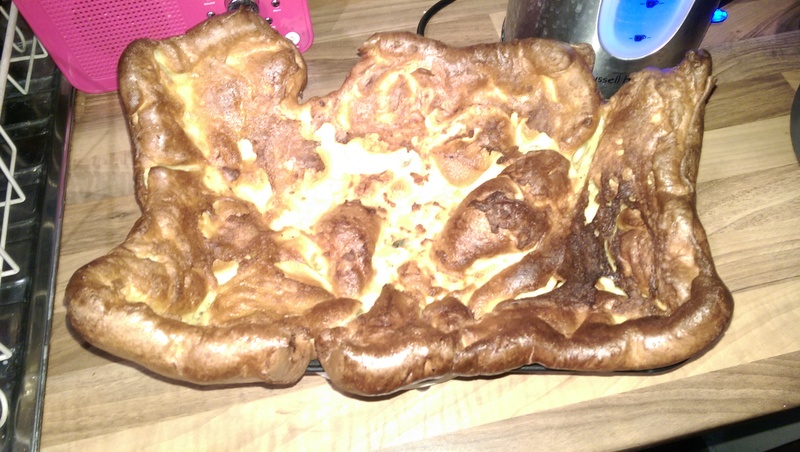 One thing I will add is that despite my exertions I did manage to make a fabulous (yes I do say it myself) roast beef and Yorkshire pudding dinner for Jackie and Camilla when they got home from work. Post-walk nutrition, good-to-excellent. Pre- and intra-walk nutrition poor-to-non-existant. 2/10 must do better. Wow! I love the look of your pudding!